The 30th edition of Standards for Blood Banks and Transfusion Services (BBTS Standards) details the latest standards of practice in blood banking and transfusion medicine. As in the past, each chapter heading represents one of the Quality System Essentials and the quality standards are supplemented by technical requirements. The effective date of this edition is April 1, 2016. A multi-user license is available for this product at a discounted rate. 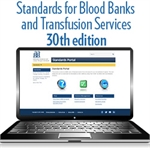 The 30th edition of BBTS Standards, effective April 1, 2016, details the latest standards of practice for accredited blood banking and transfusion facilities. It is the third set of standards to appear in the AABB Standards Portal. The Standards Portal allows users to customize their profile based on the activities for which they are accredited and can be rearranged at any time. Standards that do not apply to a user’s profile will appear grayed out to ensure that purchasers are aware of the standards that apply to their facility and those that do not. All links to outside websites and cross references to other standards in the portal are live and appear in popup windows to allow users to be able to see both the standard in question and the linked post. The full edition of the BBTS Standards (not including any guidance) is printable at any time to ensure that users can take the BBTS Standards on the go. By purchasing the Standards for Blood Banks and Transfusion Services, 30th edition (“Standards”) through the AABB Standards Portal (“Portal”), users acknowledge and agree that they will access the Standards solely for their own personal and/or professional use and not distribute, copy or provide access to the Standards for use by any third parties. Furthermore, users will securely maintain their login and password for the Portal. In the event that AABB or its authorized agents discover that users have not complied with these Terms and Conditions of Use, they understand that they will lose all rights to access the Standards and will not be entitled to any refund. New standard 4.1.2.2 allows facilities outside of the United States to have laboratory testing performed in a facility authorized by the Competent Authority in their home country instead of following US-focused regulations. Standard 5.1.5.2 has been expanded to allow facilities to use pathogen reduction technology for detecting bacteria in all platelet components. Standard 5.2.1 has added a requirement that all donors be given educational materials regarding the risk of postdonation iron deficiency. New standard 5.19.7 requires that facilities have processes in place to prevent transfusion-related circulatory overload. It is the responsibility of the ordering physician to determine which patients are at a higher risk level than others. New standard 7.3 requires that facilities have standardized terminology for classifying and reporting transfusion reactions. To purchase multi-user licenses for your organization, add the number of licenses to the quantity field above. All discounts are reflected at checkout.